The Dow Jones industrial average (^DJI) is finally taking a bite out of the Apple (AAPL). Last week's announcement that the leading consumer tech company was being added to the iconic market gauge made waves, but in the end it only illustrates how out of touch the Dow is these days. Investors know that the S&P 500 (^GSPC) -- the index that welcomed Apple with open arms in 1982 when it was much earlier in its path of market-thumping gains and disruption -- is Wall Street's ultimate measuring stick. Mutual fund managers use the S&P 500, and not the Dow 30, when it's time to chalk up their relative performance. Investors flocking to index funds choose investment vehicles that mimic the S&P 500 far more often than they do the Dow when they want their money to keep pace with the general market. It's not just because 500 large-cap companies offer broader market exposure than the 30 names that make up the Dow. The Dow Jones industrial average is a flawed metric, and the only surprise bigger than how long it took to add Apple in the first place is that it's still around at all. There isn't a lot of mystery behind why tech tastemakers Apple and Google (GOOG) (GOOGL) haven't been a part of the illustrious Dow's past. Their stock prices have been too high in recent years. That's the fatal flaw with the Dow as a price-weighted index. Most indexes -- including the S&P 500 -- are based on market cap. The biggest companies make up the biggest chunks of the performance. It doesn't work that way with the Dow. A company that happens to have a stock price of $100 contributes 10 times the weight of a $10 stock. This could be a problem when a stock has too high a price. That was the case with Apple when it traded just north of $705 at its pre-split peak three years ago. If we add up the 30 Dow components -- or 29 if we subtract the departing AT&T (T) -- we get $2,747.10. If Apple were still trading at $705, it would account for 20 percent of the index. That would be too much. If shares of Apple ever tumbled 10 percent on a bad earnings report, the Dow would lose 2 percent of its value. If the stock happened to soar 25 percent on the rollout of, say, the iBurrito, the Dow would move 5 percent higher. It's easy to see why Apple at $705 or Google trading for nearly $1,230 the way it did 13 months ago wouldn't fly in the Dow. However, instead of conceding defeat and tweaking the methodology to get these great growth stocks in, the Dow chose to stay the course. The Dow's last major shakeup took place in 2013 when three stocks were added to the index: Goldman Sachs (GS), Visa (V), and Nike (NKE). There was naturally an outcry from Apple fans. Google's market cap was greater than all three of the companies being added combined. Apple's capitalization was nearly twice the value of the combined companies. The Dow blew it, then. Apple's stock went on to nearly double, up 95 percent in that time. 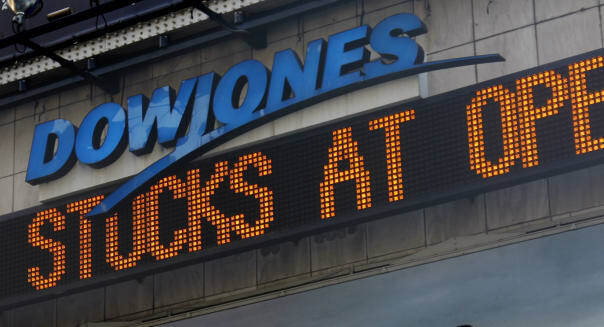 The Dow has only gone on to rise 16 percent. The gap of underperformance grows over the years. The Dow could have -- and should have -- added Apple when it introduced the iPod in 2001, the iPhone in 2007, or even the iPad in 2010. It missed Apple at every turn, and then it had to pass when Apple's stock price grew too large. There will be more Apples that the Dow misses because of its price-weighted methodology. It's irrelevant, and showing up late to the Apple party -- and doing so now only because Apple executed a 7-for-1 stock split this past summer -- doesn't make it any more relevant. Motley Fool contributor Rick Munarriz has no position in any stocks mentioned. The Motley Fool recommends Apple, Goldman Sachs, Google (A and C shares), Nike and Visa. The Motley Fool owns shares of Apple, Google (A and C shares), Nike and Visa. Try any of our Foolish newsletter services free for 30 days. Check out our free report onone great stock to buy for 2015 and beyond.